Graffiti Garage SG is a one-stop workshop for spray painting, airbrushing, bodykits and visual works on your ride! 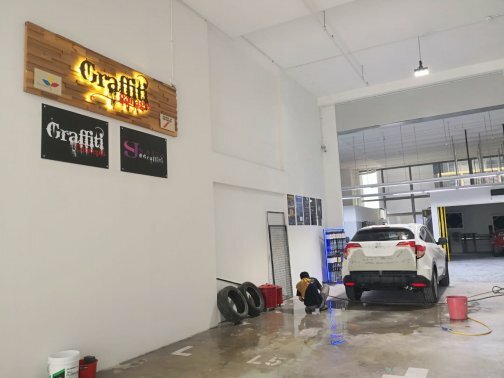 Graffiti Garage SG is located at Woodland, with the capacity for many cars at its workshop premise. Since then, hundreds of cars has been done up by their team of experienced artists, spray painters and body workers. With the skill sets and equipment, you can be sure of quality service when you send your ride in with them. Complete Bodykit for Subaru from $300 - $3000. Complete Bodykit for Maserati from $1000 - $5000. Complete Bodykit for Mercedes - Benz from $500 - $3500. Complete Bodykit for BMW from $500 - $3500. Complete Bodykit for Suzuki from $300 - $1600. Complete Bodykit for Volkswagen from $300 - $2000. Complete Bodykit for Lexus from $300 - $3000. Undercarriage led lights from $80 - $300. Led light for legroom from $40 - $160. Led Daytime running light from $100 - $180. Led door frame lights styling from $50 to $200. Customize styling led lighting from $80 to $1000.